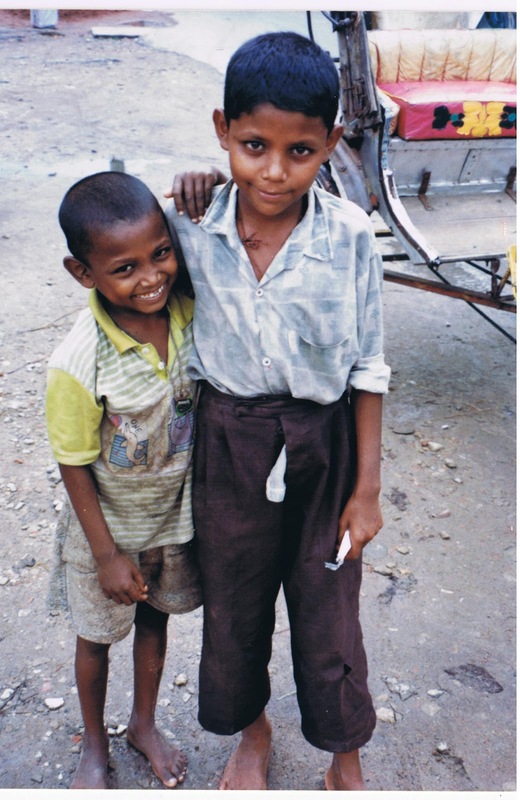 Welcome to "Friday Friends," guest blogger, Kimberly Rae, who has written a wonderful story about how she displayed the love of Christ to a young boy in Bangladesh. Milo wears little brown shorts that do not button. A necklace made of thread is his only other clothing. His feet are so tiny. One has a piece of material tied around it and he is limping. I ask to see his foot. The Bangladeshi mother does not understand my question, but she sees my hand motions and unwraps the dirty cloth around his foot, explaining in Bengali all the while. From her gestures I guess that he had stepped on a sharp object. His foot does not look good. I leave Milo and his mother and head home, grab my scarcely used first-aid kit, then return to my new little friend. It does not take long for me to realize that my mission is futile. Either the sore had scabbed over, or so much dirt has crusted in it that I cannot get it off. I try an antibacterial wipe, then an alcohol wipe. Since neither even erase the dirt marks on the surface of his foot, I know nothing I do will get to the actual sore to help. The rest is rather pointless. I apply antibiotic cream, but for no purpose since the sore is still covered, then the gauze goes on and I tape it securely to his foot. I have been talking the whole time for Milo’s sake, but all in English. Finally I say “shesh”--- Bengali for “finished,” and heard it ripple through the crowd. The smiling mother picks up Milo, while I also stand. I am shocked to see people around us in every direction. I say goodbye---see you again---to Milo and his mother, and walk to the ever-present rickshaw. The rickshaw driver is smiling at me. I hope he knows it is Christ’s love I want to show. Have I done anything worthwhile? Not really. None of the first-aid I did will make any difference. The again, perhaps other things are accomplished this day, things that were not my goal, but that held more worth than my goal. In such a place, where class and status matter, I reached down and touched a little boy who had perhaps never received any special attention in his entire life. I had touched his foot, in a land where the foot is unclean and many would be mortified to touch another person’s foot. I had smiled and tried to help, and in a country where most think that all Americans and Christians, perhaps my doing so had represented Christ in some small way. On my rickshaw ride home, I pray that God will heal little Milo’s foot. And I pray that someday, when someone tells them of Jesus in their own language, they will think of this small act of kindness, ad be willing to listen. I pray they saw His love in me. Whose foot has God asked you to touch today? Kimberly Rae lived in Bangladesh, Uganda, Kosovo and Indonesia before health problems brought her back to the US permanently. She now writes from North Carolina, where she lives with her husband and two young children. Rae's Christian suspense/romance novel on international human trafficking, Stolen Woman (Kindle version), hit the Amazon Bestseller list in 2011. Find out more at www.stolenwoman.org, or read about Kimberly's real-life adventures on her blog, www.stolenwoman.blogspot.com!